Every month, OMGWTFBIBLE snags some pretty great guests. But there’s never enough time in the podcast to discuss everything our guests our up to. Our Meet The Guest series puts the spotlight on each month’s guest. Michael Malice does not keep things to himself. As the subject of Harvey Pekar’s Ego & Hubris: The Michael Malice Story, he does not pull any punches about his family or his politics. As a co-founder of “Overheard in New York,” he shared snippets of conversation that would’ve otherwise disappeared with the world. He took on the persona of Kim Jong Il to write Dear Reader: The Unauthorized Autobiography of Kim Jong Il. And now he’s going to talk about the Bible. According to Ego & Hubris, Michael grew up in a Russian-Jewish household in Brooklyn and even attended a yeshiva for a little while. After he left a formal Jewish educational environment, Michael was forced by his father to struggle through the Talmud on the weekends, giving him a bit of insight into Jewish thought. The backstory to creating this book was nightmarish. I went to Pyongyang, got armfuls of the propaganda. I slogged through all of these communist texts. They are so tedious and mind numbing, it is almost impossible to describe, and repetitive of course. So I had to read through these books to get a view of how North Koreans see themselves, how Kim Jong Il is presented there, and to adapt it in a palatable way in the first person perspective. The result, Dear Reader, is more than palatable; it’s actually quite fun to read and incredibly convincing. Reading it, I couldn’t help but start to buy into Kim Jong Il’s narrative of his country’s history. It’s an incredibly effective bit of myth-making. 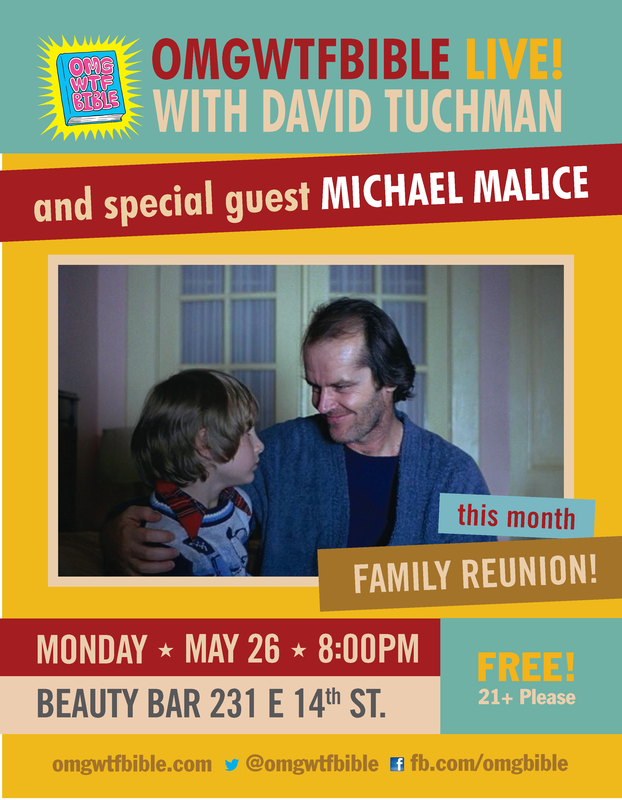 Which makes Michael a perfect person to read some Jewish myths with me at Beauty Bar on May 26! This entry was posted in Announcements, News and tagged american splendor, atheism, atheist, cut me loose, dear reader, ego and hubris, harvey pekar, jew, jewish, joseph, judaism, kim jong il, memoir, michael malice, north korea, podcast, politics, religion, torah by omgwtfbible. Bookmark the permalink.